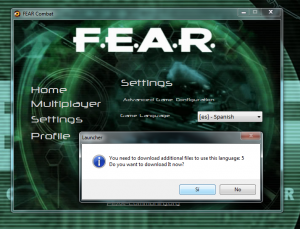 Changing the game language with the launcher doesn’t work anymore. A new installer with the languages will be released in short. Even If you get the launcher, you still need get the latest game patch, It fixes all the known bugs in the 1.08 version. 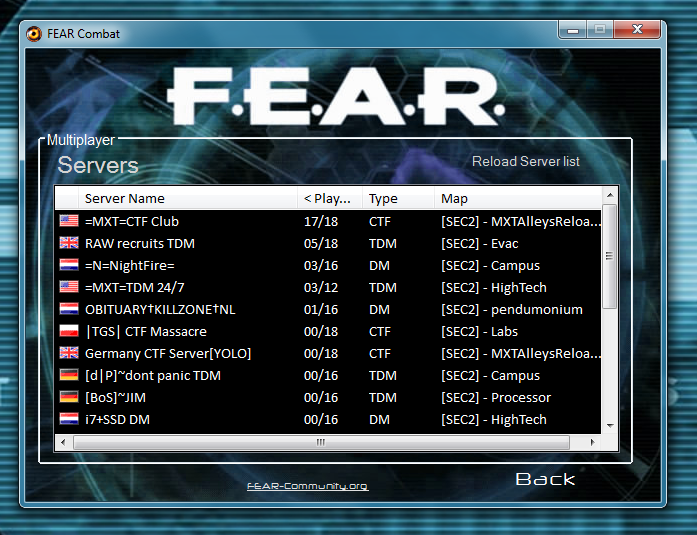 Is a tool developed to help you change your Game language, change the CDKey and find and Join FEAR Servers. In the Downloads section of this site. You don’t really need It anyway. The latest patch fixed the issues the launcher was trying to workaround. 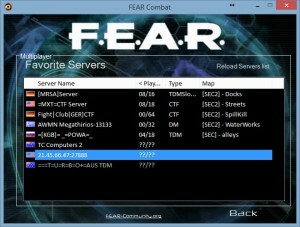 Fixed missing servers in fav and recent list. 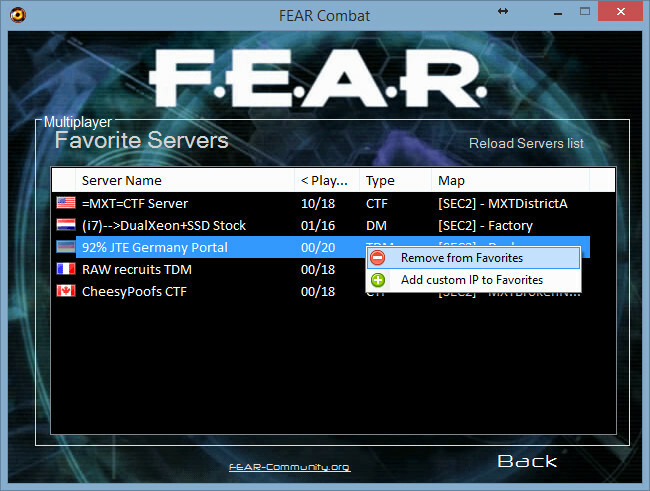 Servers Listing rewrote to improve responsiveness (Server list loads x10 faster). Supports full list of active servers (doesn’t try to verify If they are reachable from the host machine). Supports recent servers and favorite servers too. 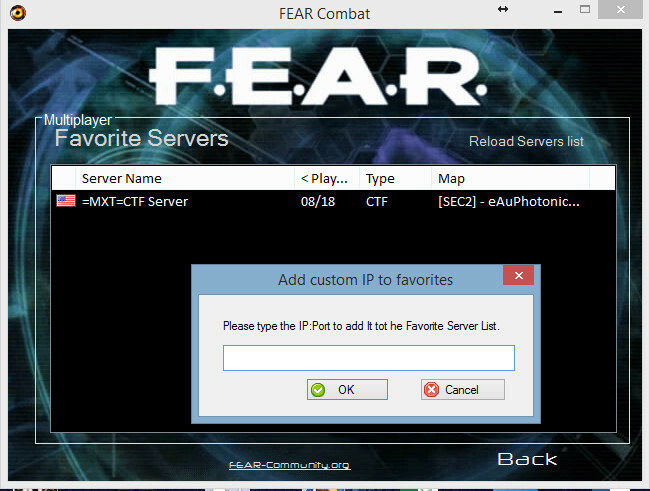 Allows adding Custom IP to favorites and context menu to add to favorites. Run and play! 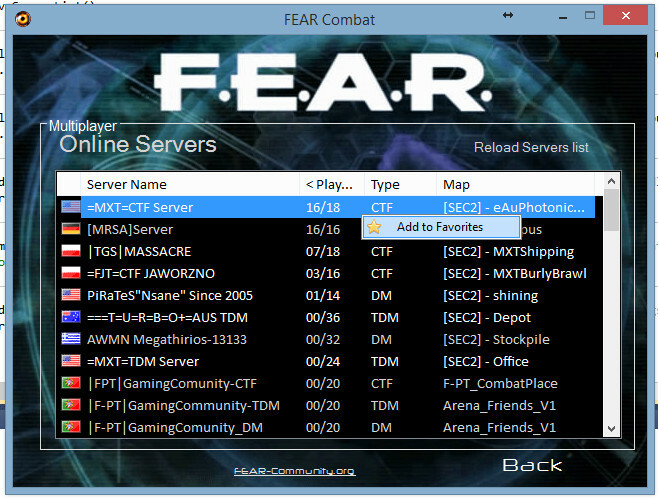 You no longer need to manually copy It to the Game Directory, automatically will try to locate the FEARMP.exe file and copy to the proper location. 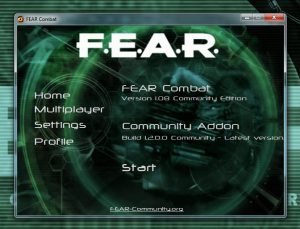 Supports scenarios where you have several versions installed, FEAR, Steam FEAR, FEAR Combat, Portable versions, and will allow you to select the one you want to use. It automatically will create required files for multilanguage support; when you select a different language, It wil download the required files (about 120 MB, each language). 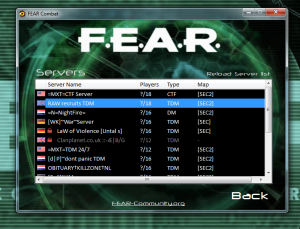 Restored all Server list functionality, including online players, map and password protection. Has a list of working Servers, same than ingame list when you have the latest patch. Update/Change your CDKey (Supports Old and SEC2 Keys), warns you about missing or misformed Key. 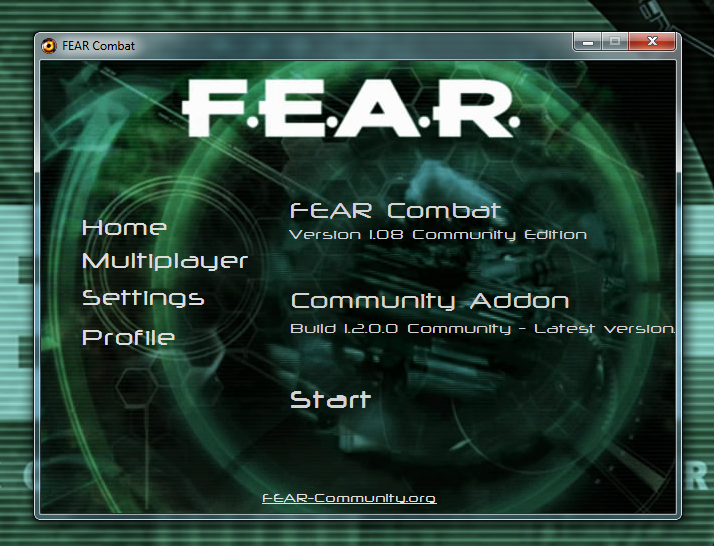 Supports FEAR Combat and FEAR Retail (and Steam Version). .net Framework 3.5 To Download Language files FEAR Launcher uses Admin Rights, If you disabled UAC then run It as administrator. Text in non-latin languages doesn’t look fine, but everything works. If you have this problem, click the “use safe fonts” option in the settings section. The CDKey check is only about key lenght, doesn’t mean the key you type is valid, only warns you about the size. 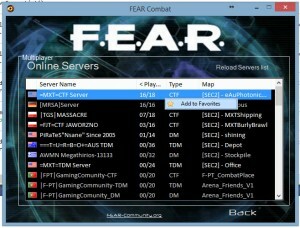 Portuguese language causes errors in some servers, we didn’t develop It, and Is kinda outdated, Was made by Gamevicio.com maybe you want to contact them for support (And say thanks in our name, I failed to contact em). Hungarian language won’t work for some reason, contact us to get the files manually. 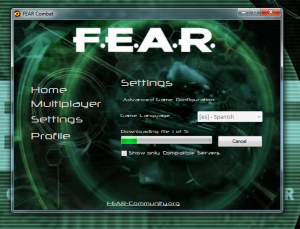 If you cancel a language download It can cause error trying to run the game. Simply select English language and delete the temp. files in the Languages/language directory. (Example, If you cancelled German download, Delete the files inside “Languages/de” folder. Do not delete the folder Itself. 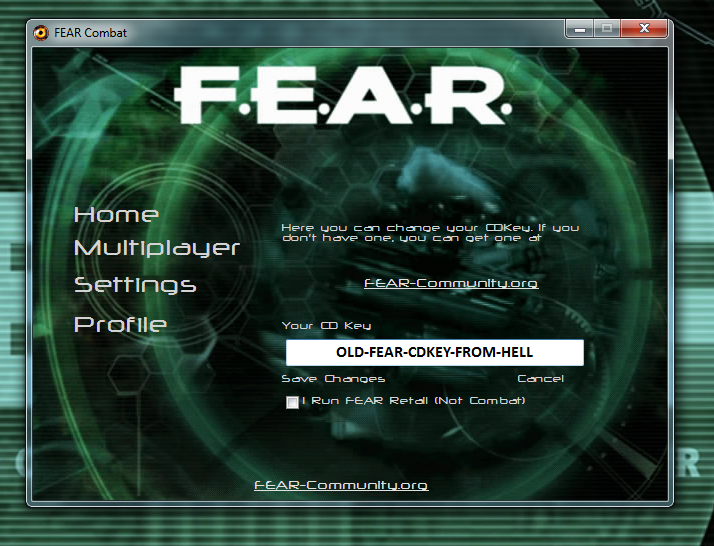 It will overwrite existing copies of the Launcher when automatically moving to the Game Directory. When you paste your SEC2 Key, verify you didn’t add extra white spaces in the end of It (The Launcher color will turn red, remove the extra spaces and It should go back to green/blue). It only lists Servers using SEC2 (They use the FEAR-Community.org FEAR Master Server). This list is the same than you get ingame and in this page. Steam users: The Launcher can be used to translate the full game to the choosen language, but that will cause problems with the single player. To Fix this, open Default.archcfg with notepad and delete the last line ( “SEC2” ); this will allow you to play the game. Do not change the game language until you want to go in Multiplayer, after you select again a language in the launcher, It will undo this change, and you need to delete the last line again to make single player work again. Use the contact form, we apreciate feedback.